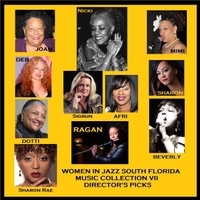 © Copyright - Women in Jazz South Florida, Inc. / Wijsf, Inc.
Top 11 Director's Picks from 6 compilation CDs of women's music by members of Women in Jazz South Florida, Inc. from 2011 to 2016. Top eleven Director's picks from six compilation CDs of women's music from members of Women in Jazz South Florida, Inc. The WIJSF Music Collections (6) consist of 63 songs from 45 women composers. These 11 songs were chosen by the organization's Executive Director Joan Cartwright as her Top 11 picks. Nevertheless, the remaining 52 songs are well worth their weight in gold! Since 2011, WIJSF has released six CDs of women's music. This 7th CD is the Director's pick of 11 of those songs. This was a hard choice because so many of the 63 songs from 45 women composers are top notch! Enjoy this CD download and tell somebody to support the music of women!